I presented the petition to make it safer for children crossing roads to get to Theale Primary School to the WestBerks Council's Executive meeting this evening. It had 138 signatures. Thank you to everyone for signing it! Meadow Way, Theale, 9th December 01:30-07:30 – Overnight on Tuesday a garage at the end of the garden has been broken into and a motor bike stolen. Planning application 14/02110/FULEXT to build 27 retirement flats on the land behind 40-58 High Street will be heard by the Eastern Area Planning Committee on Wednesday evening (10th December)..
People who object to the plan will be able to speak at the committee meeting for a total of five minutes. Anyone who wants to speak needs to inform the Council's planning department on 01635 519111 before 4pm on Tuesday 9th December. This application is the first one on the agenda. The plans for the application can be viewed by clicking here. 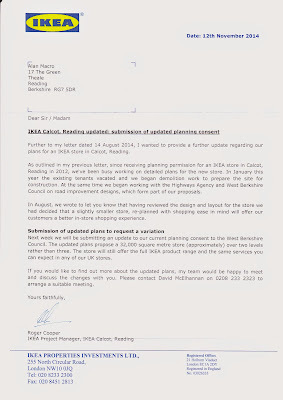 West Berkshire Council has now received the new plan for the proposed IKEA store in Pincents Lane, Calcot. The proposal is now for a two-storey store, rather than the original three-storey one. The application number is 14/03032/COMIND. The full set of plans can be viewed here. Marked dog fouling in Blossom Avenue and Crown Lane today after residents' complaints. Marked dog fouling in Blossom Avenue and Crown Lane, #Theale, today after residents' complaints. The blue marking will help people avoid the fouling and may shame the dog's owners. The Eastern Area Planning Committee will be making a site visit to the site behind 40 to 58 High Street at about 10:10 am on Wednesday 3rd December (the time is not exact because the committee will be visiting another site before this one). The visit is for committee members to see the site, its location and its relationships to other buildings. There will be an opportunity for residents to point issues out. The application will almost certainly be decided by the Committee at its meeting on 10th December. This will be held at the Calcot Centre in Highview (off Royal Avenue). The meeting will start at 6:30 p.m. The application number is 14/02110/FULEXT and plans for the application can be viewed at http://publicaccess.westberks.gov.uk/online-applications/applicationDetails.do?activeTab=externalDocuments&keyVal=NAWRUARD04Z00 (click on the Documents tab). I was interested in your story that IKEA will soon be submitting a planning application for a smaller, two-story, store in Calcot (Chronicle, 20th November). The previous plan was for a three-story store that was 60 feet high. 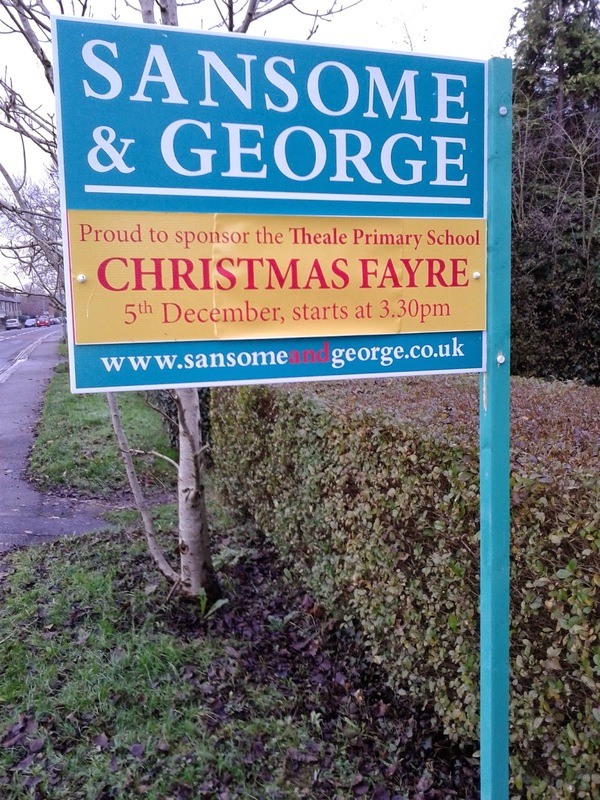 This would have been clearly visible to many homes in Theale. I therefore hope that the latest plan will be for a store that is less visually intrusive. There is much concern in Theale and Calcot over the traffic that will be attracted to an IKEA store and the congestion this may cause. 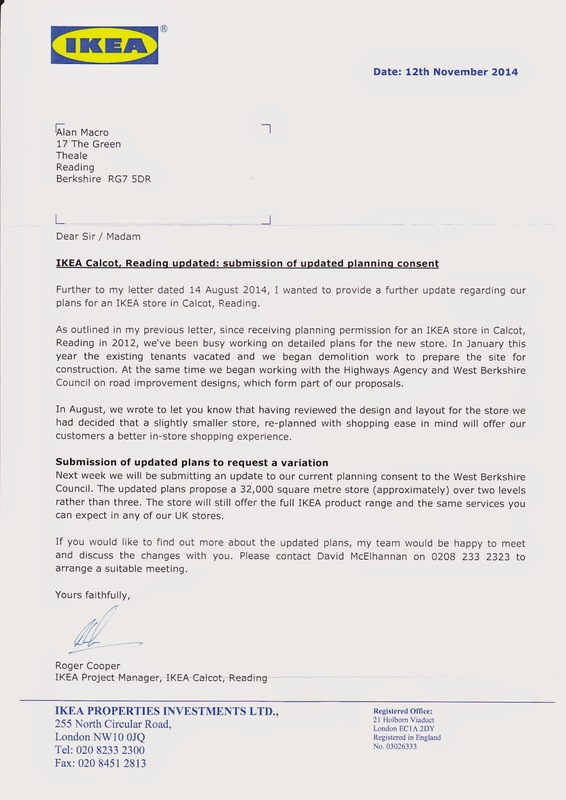 I therefore hope that a smaller store will not be used as an excuse by IKEA for reducing their contribution towards road improvements. Please remember that the Co-op in Theale will be closed from Monday (24th November) for refurbishment. It is due to re-open on 4th December. Visited the M4 J3-12 "Smart Motorway" project exhibition in Theale Village Hall. Lanes one (currently the hard shoulder) and four will be surfaced in noise-reducing asphalt throughout from J3 to west of J12. All lanes on the eastbound carriageway will be surfaced in this material from west of J12 through the junction. This will result in a small reduction in traffic noise affecting the Woodfield Way area. There are to be NO noise reduction fences near Theale, though. There will still be three lanes through J12. There will be four lanes all the way from J12 to J10 and from J10 to J4B, making use of the current hard shoulder. It is proposed to have just two Emergency Refuge Areas (laybys for emergency use) eastbound between J12 and J11 and three westbound. Broken-down vehicles will be detected by a mixture of wire loops in the road and radar, triggering an automatic 40MPH speed limit and alerting monitoring officers in the control centre. Work is expected to start from the Theale (J12) end in 2016 and then work eastwards. A story has been published in this week's Newbury Weekly News with a quote from me on the possible effects on Theale if AWE Aldermaston is selected for this project. You can read the story here. The project is to dismantle unused British nuclear submarines (17 at the moment) and to store the resulting intermediate nuclear waste until at least the 2040s. The waste would have to be transported from the place where the submarines are dismantled to the site selected for storage. If AWE Aldermaston is selected, the waste may be transported along the Theale bypass. The Atomic Weapons Establishment sites at Aldermaston and Burghfield are two of the sites being considered for the Submarine Dismantling Project (SDP). This project is to dismantle de-commissioned nuclear submarines. This may be for the long-term storage of the intermediate radioactive waste comprising the components from reactors dismantled elsewhere. It may also include the dismantling itself. The waste would have to be stored until at least the 2040s. There are currently 19 disused British nuclear submarines awaiting dismantling. More information on the SDP can be found at www.gov.uk/government/news/sites-for-submarine-dismantling-consultations-confirmed. The Community Sports Association is what was previously known as the Civil Service Association and is near AWE Burghfield. There are also a series of workshops where you can discuss the proposals. You will need to book a place using this booking form if you want to attend a workshop. You don't need to register for the exhibitions. An exhibition of the proposals for the son-called M4 Smart Motorway Project will be held in Theale Village hall on Friday 21st November between 2pm and 8pm. The exhibition is part of the consultation that the Highways Agency are carrying out on the scheme. The proposed scheme will convert approximately 32 miles of the existing M4 from junction 3 (Hayes) to junction 12 (Theale) to a smart motorway. IKEA announced in August that they were now intending to build a smaller, two-storey, store rather than the three-storey store that they got planning permission for in 2012. On the face of it, reducing the height should reduce its visual impact on Theale. What is not clear however, is whether IKEA expect fewer customer visits to the store. If there will be fewer customers, it should mean less traffic of course. Buses leave Reading Station at 21:00, 22:00 and 23:00 and return from The Green at 21:30, 22:30 and 23:30, calling at The Crown two minutes later. This service is an experiment and we will lose it if we don't use ir. It was scheduled to make the final decision on the sites to be allocated, after taking account of the consultation, at a Council meeting in December. However, there were so many responses to the consultation that the decision has now been delayed. There were some 8,500 individual comments from about 4,500 people. About 18,500 separate "points" were made in those comments. Only about half of the comments have been initially processed so far and work on investigating the individual points has not yet started. Therefore residents will not know for some time which sites around Theale will be allocated for housing. I am disappointed that decisions on which of the "preferred option" housing sites will be approved for allocation, including the four in Theale, will be made behind closed doors. The decision on which sites should go to consultation was formally made by a meeting of West Berkshire Council in the early summer. However, this "rubber stamped" recommendations made by the Planning Policy Task Group, which meets in private and whose minutes are confidential. This meant that residents were not aware of the reasons why particular sites were selected. I was not happy with this and proposed that the decision on which of the sites consulted on should be approved for allocation should be made by a Council committee in public. However, this proposal was voted down by Conservative councillors at a special meeting last Thursday. This means that the discussions and decisions on the sites to be allocated will continue to be made behind closed doors. I am pleased to see that work is about to begin on the pedestrian refuge on the A4 near the end of Wigmore Lane, Theale. The refuge will make it much easier for Wigmore Lane residents to cross the A4 to get to Theale village or the bus stop. The work is being done as a result of the petition I raised a few months ago. 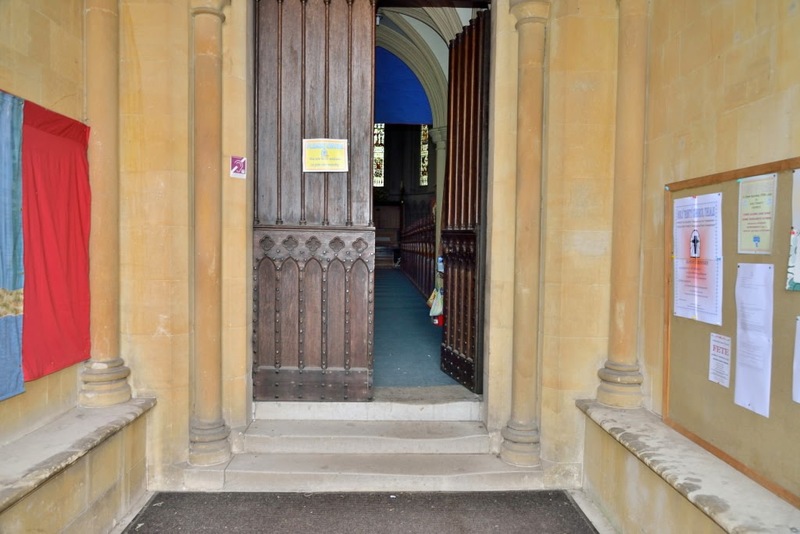 If you saw anyone acting suspiciously around the church at that time, please inform the police on 101. This should mean that building work is now starting in earnest. Many residents in Englefield Road thought that the foundations were being put in in the wrong place as they were much closer to their back garden fences that the plans suggested. The West Berkshire Council Planning Enforcement Officer investigated at my request and found that they were in the correct position in relation to the houses. He said that the plans did not show the correct position of the fences. They used to stop before the top step was reached. The top flight does not have any handrails at all. 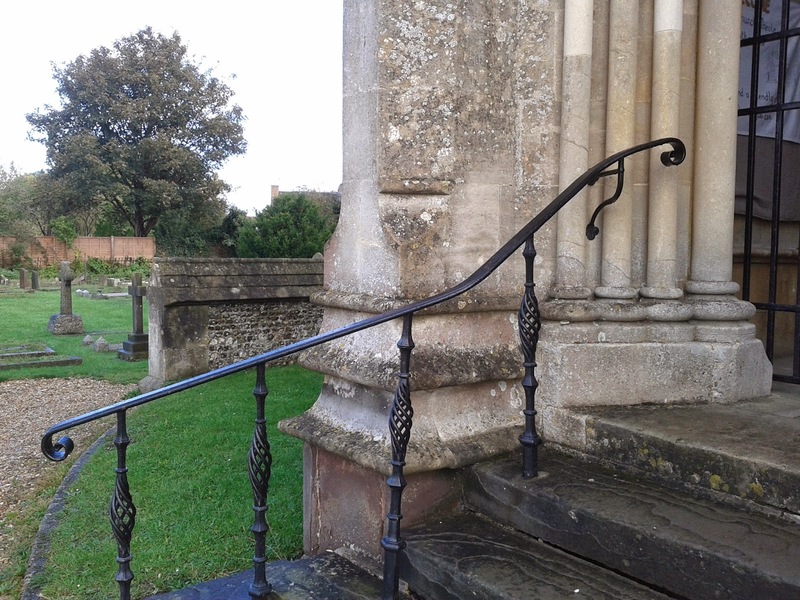 Handrails will soon be installed, however, thanks to a grant I got from West Berkshire Council. Sorry, but I will not be doing my regular Theale High Street walk-about today. I will be on a training course in Reading. I hadn't heard anything for a while about planning application 14/00549/FULD to build a block of six flats on the old Le Claire Precision/Not Just Cleaning site in St Ives Close. A resident said that he had not been able to find it on the West Berkshire Council. I couldn't find it, either. I therefore asked the Eastern Team Leader in the Council's Planning Department about the application. He has replied that the application was ruled invalid and there is no current application for the site. The autumn round of apprentice recruitment has been launched by West Berkshire Council. The council works in partnership with West Berkshire Training Consortium (WBTC) to help apprentices achieve an Intermediate Apprenticeship award during their year in employment. Alan Law, West Berkshire's Executive Councillor for Human Resources, said: "I'm delighted by the continued success of West Berkshire's apprenticeship scheme. Our scheme is a great way to earn while learning and get young people on the ladder to real career opportunities." Visit www.westberks.gov.uk/apprenticeships for further information and details on how to apply. Applicants are advised to search using the term ‘Apprentice’ in the keyword section on the West Berkshire Council vacancy home page. From October 1 2014, apprentices will receive the National Minimum Wage; £3.79 per hour if under 18, increasing to £5.13 per hour if aged 18 to 20 years old. Please note due to government funding restrictions, West Berkshire Council will only accept applications from those aged 16 - 19 years old on the start date of apprenticeship. Contact Jaskiran at WBTC on 01635 35975 or email her on Jaskiran@wbtc-uk.com to arrange. 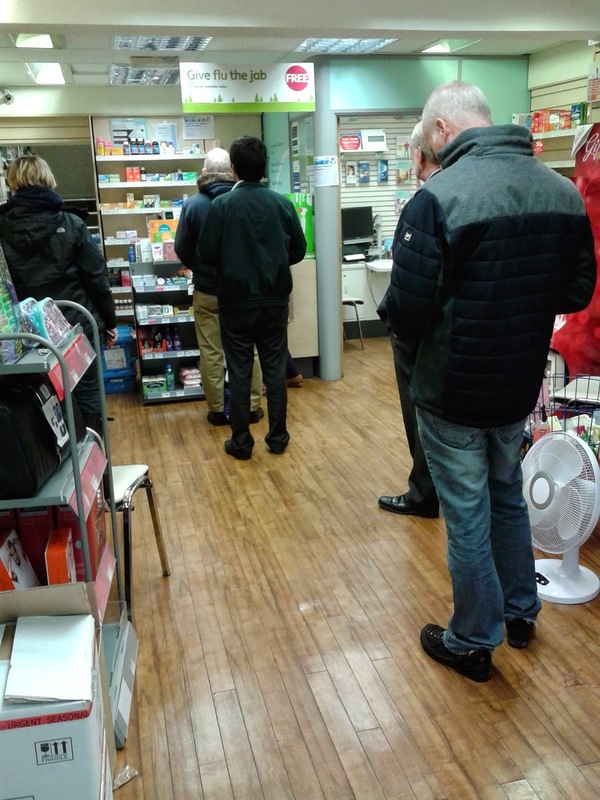 There were long queues in Theale Pharmacy again yesterday. The queue got up to nine people while I was there and three people turned away. One lady had been waiting half an hour. Things work well when the regular pharmacist and staff are present but do not work well when temporary staff are on duty. This was the situation yesterday. I am concerned about the effect that the poor service is having on Theale residents. I am also very concerned that customers who have transport may instead choose to go to the pharmacy at Sainsburys to avoid the queues. This could put the future of Theale Pharmacy at risk. If it closed then people who do not have transport would be put in difficulties. I therefore called Customer Services at Lloyds to express these concerns. A #Theale resident asked why one pothole in his road was filled, but not the one next to it! "why did they fill one hole outside our house and left the one next to it"
I expect that we have all wondered that! Thames Valley Police have announced that the closed Theale Police Station is to be sold. A story in the Reading Chronicle says that the closure will save £24,000 per year, which seems unlikely given the size of this modest building. 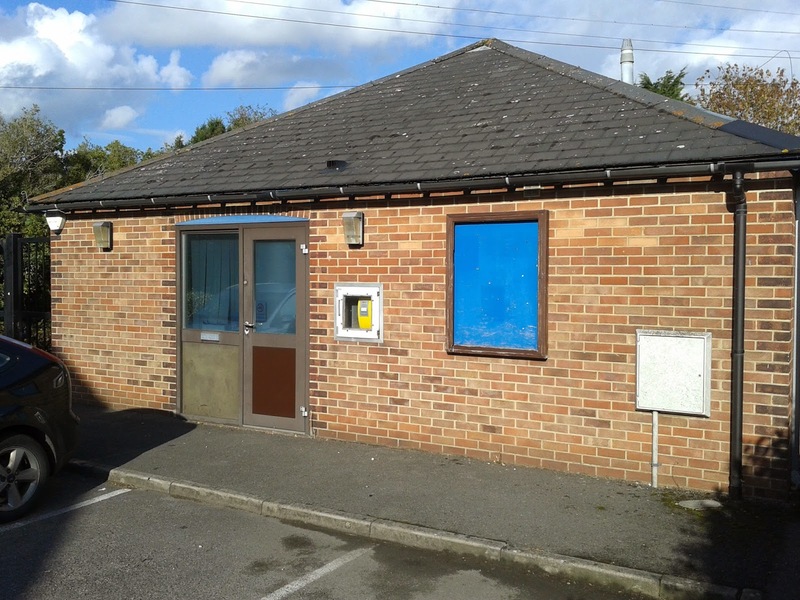 The station was closed several years ago and has been used since by the TVP property department.The building is sandwiched between Theale Library and the main entrance to Theale Green School, so the possible future uses for the building must be limited. However, the police refused to release the building. A new litter bin has been installed by the Council on the green area at the end of Mulberry Way. Litter bins, including this one, can be used for disposing of bagged dog waste as well as litter. A consultation event is currently taking place describing Hope Cement's proposals for new facilities to import aggregate by train, and for making concrete, at its depot in Wigmore Lane, Theale. The unloading of trains and movement of aggregate around the depot will be done by tractor shovel. I have therefor asked them to provide dust supresion equipment. I have "called in" planning application 14/02110/FULEXT to be decided by West Berkshire Council's Eastern Area Planning Committee, rather than by planning officers. The application is to build 27 retirement homes behind 40 to 58 High Street, Theale. This is the land behind Kaya's (the old Cumbers butcher's shop), Lloyds Bank, Courts Newsagent, etc. I have done this because of concerns raised by residents and parish councillors at the recent special meeting of Theale Parish Council. This meeting was called to discuss this application. You can view plans and documents about this application here. Planning application for 7 houses at end of St Ives Close, #Theale, to be withdrawn? The West Berkshire Council planning officer dealing with planning application 14/02195/OUTD to build 7 houses on land at the end of St Ives Close has advised the applicants to withdraw it. The officer advised the applicant to withdraw the application and that his recommendation was likely to be that the application be refused. The email to the applicant can be viewed here. It often advantageous for an applicant to with draw an application rather than have it refused. 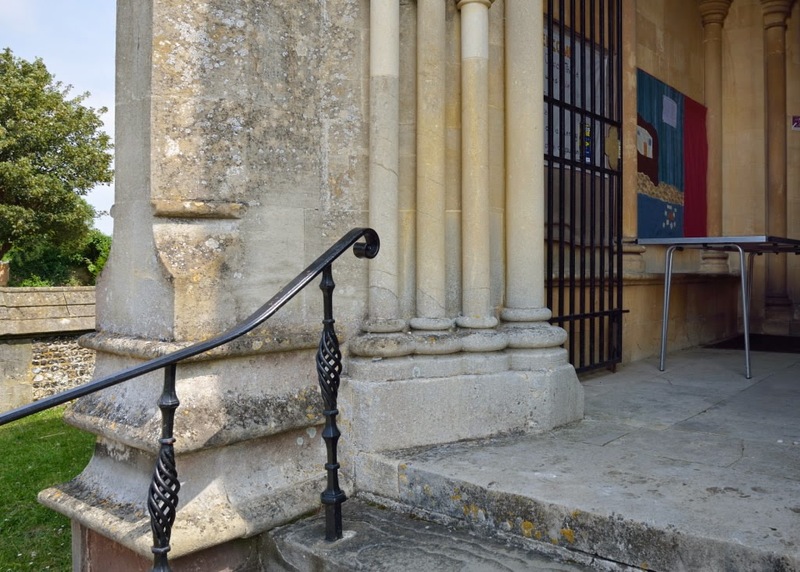 The Church has a project to extend the handrails for the bottom steps and to provide handrails for the top steps. The new handrails will be in the same style as the existing ones. A grant to help pay for them was agreed by the Dr Ellerton Trust. However, this still left about £1,500 to find. I therefore made a "member's bid" to West Berkshire Council to make up the difference. I am delighted to tell you that this has been agreed. I had a complaint about a month ago that these flats were being built much closer to the back gardens of properties in Englefield Road than suggested on the plans. The 30 flats are being built for Sovereign Housing Association and will accommodate people over 55 years old. They are being built on the site of the old Trafalgar Court care home, which has been demolished. I asked the West Berkshire Council Planning Enforcement Officer to investigate. He made several visits to the site and discussed the situation with the developers and with the Planning Officer who dealt with the planning application. After taking several measurements he came to the conclusion that the flats were being built in the correct location. His main concern was their location in relation to the surrounding houses. It appears that either the plans submitted with the planning application were not correct regarding the rear boundaries of the gardens or that the gardens had been "extended". The latter seems unlikely! I am going to nominate Julian Swift Hook, Lib Dem Councillor for Greenham, to take part. Work on the new bridge and lifts is now scheduled to start in October and be completed in July 2015. The new building has been built close to where the lifts will be and is some distance from the existing footbridge. The existing booking office will therefore continue to be used until the lifts are ready for use. We have had further complaints today from residents in other roads in the village about parents parking across driveways, preventing people from leaving their properties. Please ensure that when parking you are considerate and do not block driveways and garages. I have had many similar complaints in the past from residents who live near Theale Green School. If you are a parent or a carer of a child at one of our schools, please be considerate of residents when parking. I submitted my petition asking West Berkshire Council to urge Reading Buses to reverse their change to the simplyReading flat fare zone boundary to the Council meeting this evening. The boundary change caused bus fares between some stops in Theale and Reading to increase by 60%. The petition had been signed by a total of 216 people. Thank you to all of you that signed! The applicant approached me last Saturday on my High Street walk-about and told me that he had been advised by the West Berks planning department to withdraw the application. The fact that he hasn't suggests that he will appeal against the refusal. If you, like me, were really impressed with the panorama of the north side of Theale High Street as it was then you may be interested to know that it was drawn by Roy Townsend, who lives in Church Street. The drawing is annotated with who used to live in the houses and ran the shops, pubs (a lot of those!) and businesses, and what they are today. Roy had to "burn the midnight oil" to get the panorama finished in time to be exhibited at the WW1 Fete. Theale Parish Council hopes that the panorama can be put on permanent display soon. 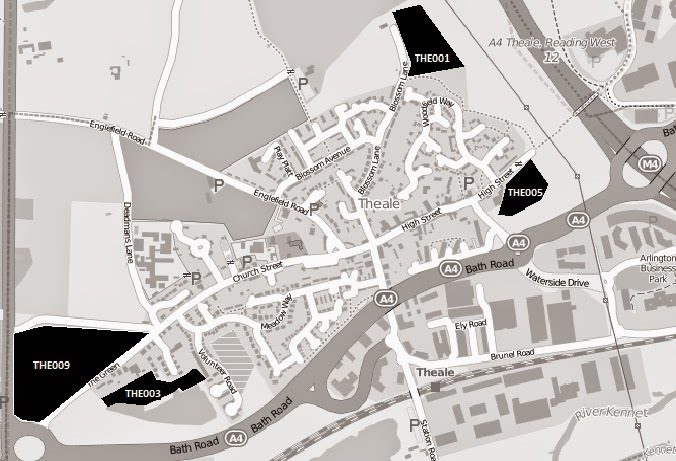 Get your comments in on 4 proposed sites for 313 houses sites in Theale now! If you, like many Theale residents, feel strongly about any of the four Theale sites being allocated for housing and you haven't put in your objection, then please do it now. If you are going to post in a form or a letter, you must get it in the post before the last post collection tomorrow (Thursday 11th September)! If you cannot do that for some reason, please pop it through my door at 17 The Green and I'll make sure it gets to the Council in time. If you are going to use the Council's Consulatation Portal or email a response form, then it MUST arrive before midnight on Friday 12th September. However, please don't leave it to the last minute! Please see www.theale.org.uk/housing-sites.html for more information on the proposals and the sites. Please see www.theale.org.uk/consultation.html for more information on how to have your say. You can download a comment form from here. Please make sure that you put the site references (THE003, etc.) in your response. If you object to all of them, then please put them all in. 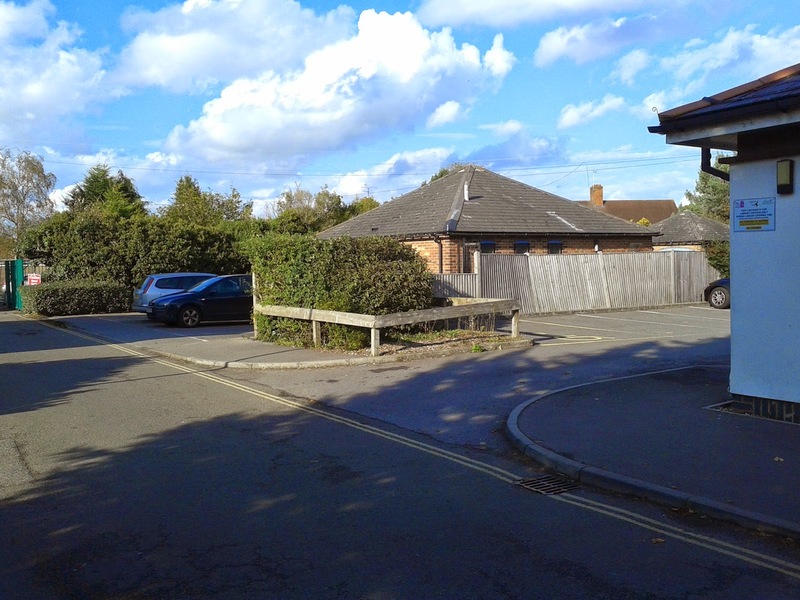 A special meeting of Theale Parish Council will be held on 22nd September to discuss the planning application for "27 Retirement Properties" behind 40-58 High Street, Theale. The council will decide whether it will object to the application and, if so, the reasons for the objection. The meeting will start at 7:30pm and Theale residents will be able to speak at the start of the meeting. This planning application is for two blocks on the site behind Kaya's, Lloyds Bank and Courts newsagent in the High Street. It is similar to the one that the developers exhibited in John Cumber Hall a couple of months ago. The access would be from the alleyway between Cropper's and Kaya's. The plans and other documents can be viewed by clicking here or by going to www.westberks.gov.uk and searching on the application number, 14/02110/FULEXT.